Stephen King is always a great storyteller. He has a talent for the linking the things that make us most human to the things we most dread and making us care as much as we fear. During the course of his (usually long) books, he slowly lures us into the places where the supernatural is so close, we can smell the rotting flesh of its last meal on its breath. I'd expected him to do that again with “The Girl Who Loved Tom Gordon”. I’d thought I’d get a tense story about the bad things that happen to little girls who get lost in the woods, invoking all the things that lurk in the deep dark and reminding us what it feels like to be prey. Instead, Stephen King did something quite different and wonderful: he narrowed his focus down to the internal dialogue that drives Trish, nine years old, almost ten and big for age, to persist in struggling not to die in vast Maine woods that she is alone and lost in. In some ways, this is a book in which nothing much happens. Trish gets separated from her mother and brother and finds herself lost in the woods and does her best to find a way to walk out again. Yet, from the beginning, I kept wanting to know what happened next and by the end I cared passionately about whether Trish would survive. Trish is brave and resourceful and unyielding. She’s also, as she tells us from time to time, just a kid. She’s afraid. She’s furious at the unfairness of her situation. She cries. She throws tantrums. Then she persists. Following along with Trisha, we learn about her (recently divorced) parents, her brother, her best friend and her favourite boy bands. We share her triumphs, her setbacks, her hallucinations and her growing awareness, as the days pass, that death is stalking her. Trisha has two prized possessions with her, her Red Sox baseball cap, signed by Tom Gordon, her favourite player, and a Sony Walkman that allows her to listen to distance Sox games when the forest night surrounds her. The games become her anchor, a symbol of her hope, a tether to the world she is trying to get back to. Tom Gordon, who is the Sox closer, brought in at the end of the game to close down the other team, becomes the emblem of her courage and the means by which she explains to herself her relationship with growing probability of her own death. From him she learns that you may be beaten by the other team but you should never be beaten by yourself. The writing is wonderful, simple on the surface but with flowing rhythms beneath the surface that entrance the ear and build meanings on simple phrases until a verbal Fibonacci Sequence unfolds. Stephen King can take a radio jingle, “Who do you call when your windscreen ‘s busted” and turn it into a leitmotiv for the desire for rescue. The pace is perfectly controlled and cleverly structured around the innings of a baseball game. 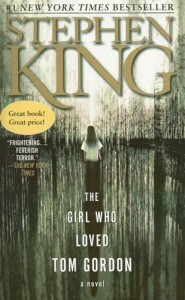 I recommend the audiobook version of “The Girl Who Loved Tom Gordon”. It’s performed by Anne Hech, who does a superb job of making Trisha real and made this an even better read.